Old friends coming to visit from far away not only provide a nice respite from the normal routine but also a wonderful chance to catch up. And if you're a friend is a coffee lover, it's also a good chance to take them by a few favorite spots. So when my wife and I met a good friend in Scranton, we made sure to factor some good coffee into the equation. We had a nice cup of coffee from the Clover at Zummo's Cafe despite one of the employees having quite a cranky demeanor about telling us it was closing time (and what's up with the weird hours as of late?). 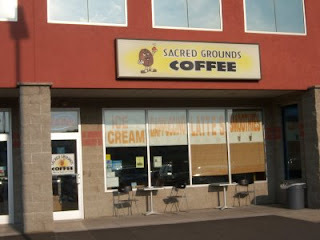 So since we were thus driven from one coffee spot, we decided to try out another down the road called Sacred Grounds. After a little seeking, we found the coffeehouse in a bland looking shopping center off of Olive Street. 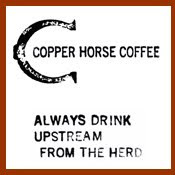 The coffeehouse boasted a fluorescent sign with a California Raisin/Coffee Bean hybrid accompanying the name. The interior was a bright mix of orange and black accompanied by tropical plants and a decent amount of seating. The coffee comes from a roaster called Barrie House though the day I stopped by, they were brewing a different coffee (I believe it was Mayorga but the barista was very quick in flashing the bag). The coffee was smooth and none too harsh, but I can't really say it had any distinct flavors to it. Still, not bad. 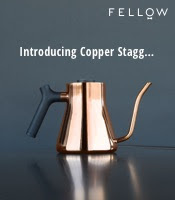 The espresso proved a little disturbing, as it resulted from the barista only adding enough coffee to fill a fraction of the portafilter and was then pulled so long that my doubleshot was about 8 ounces (it filled half a large mug!). Needless to say, it proved to taste like a bitter cup of strong coffee. The tea was Wagner's Tea. Though the experience at Sacred Grounds proved somewhat off, the day was still well spent with a good friend (she was very thankful for the two stops too). But given the level of training and seeming lack of coffee passion, I don't think I'll be going out of my way to stop in again. But if you happen to be in the shopping center or the adjoining ice rink waiting for someone, give a go for yourself. Is it okay to like Maxwell House? It has taken me awhile to read your blog, but I love it! I enjoyed that day very much. Thank you! Your friend from the North!